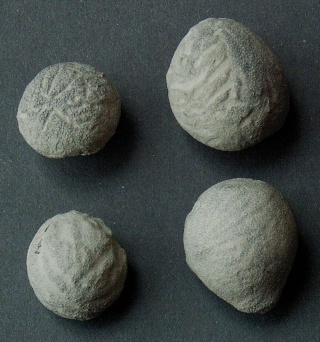 At Misburg and Höver, Porosphaera globularis appears to be the only common representative of the class of Calcispongea. 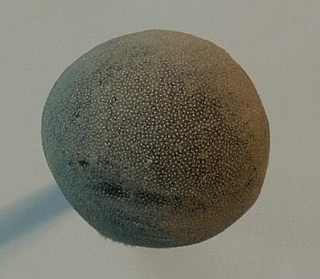 As the name suggests, this sponge is usually of spherical habit, at least in its youth. 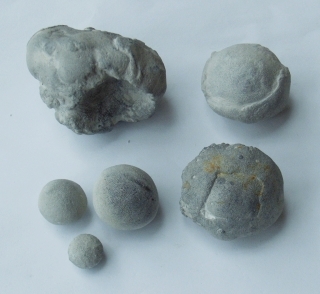 Perfect spheres, as the one shown in the first picture, are quite common and often reach diameters up to about 20 mm. However, there are also larger specimens, which then develop more complex shapes, as shown in the second picture (perhaps another species ?). Commonly, there are cylindrical holes in the spheres, which are thought to be boreholes inflicted by worms. The skeleton of Porosphaera is visible under the binoculars at 30- or 60-fold magnification. 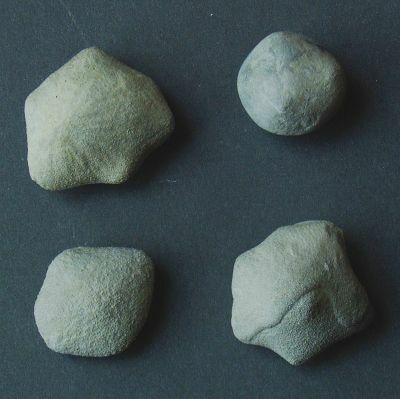 It is composed of the typical triactine skleres of calcispongea. Porosphaera woodwardi is much less common than P. globularis. It differs from P. globularis by the presence of grooves, often radiating away from slightly pointed exhalent centers. There is also a conspicuously angular form of Porosphaera, which is much less common than P. globularis. Porosphaera patelliformis has been reported from the Alemannia pit at Höver. 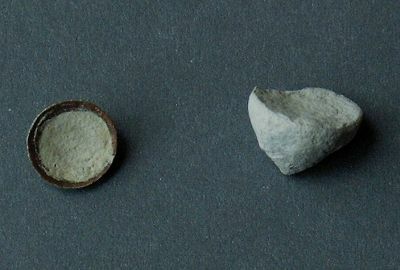 It occurs as small hemispherical to conical cups.